The Finley Review is the community newsletter and forum for Property Managers and Commercial Road Construction professionals. We cover all the news that covers parking lots, streets, roads and highways in the North Virginia area. 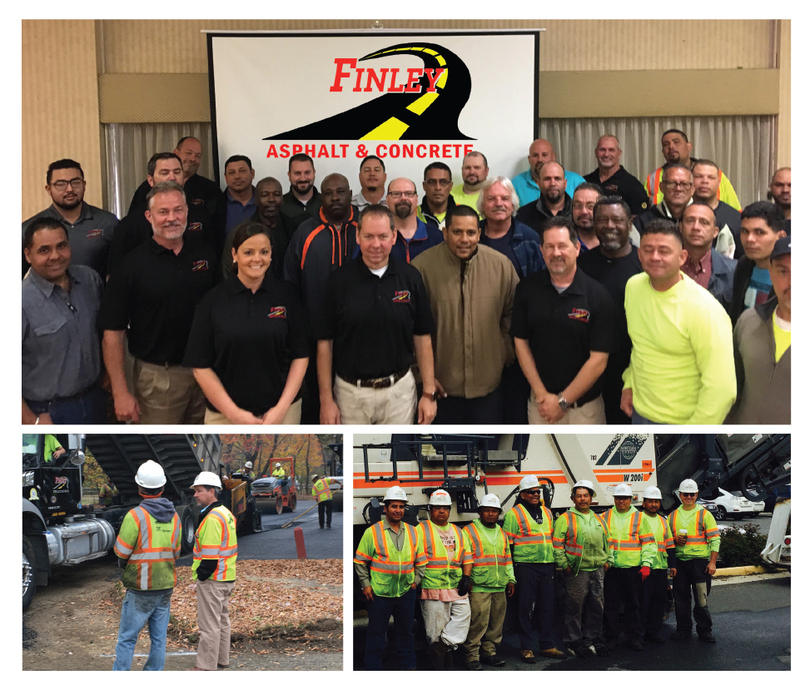 MANASSAS, Va., Jan. 15, 2018 /PRNewswire/ -- In the first yearly executive board meeting led by company President Lewis Finley and CEO Erick Finley (plus other leading members) of Finley Asphalt & Concrete, the 50+ year paving company unanimously assembled to carve out a brand new and significant position of CHIEF OPERATING OFFICER- a leadership structure upgrade dedicated to meet the company's 2018 expansion plans. This vital role was appointed to Mr. Glenn Shapiro on the eve of his first year anniversary when he assumed the title of Vice President. By definition, a Chief Operating Officer position holds the leadership and management capacity necessary to ensure that the company has the proper operational controls in administrative, reporting procedures, and people systems. One who holds this rank shall pursue continued and overall growth of the organization from the various significant angles while supporting both financial strength and operational efficiency. Fulfilling the title of COO, Glenn Shapiro was dubbed this position as part evidence of Finley's evolutionary directive from the "family-style" blueprint it was founded with- to the modernizing roadmap that its future expects and deserves. He was carefully hand-selected based on his proven level of commitment to the company's overall mission. "By modifying our leadership structure, we are (now) able to better diversify, manage our productivity, cover more ground and gain new strength from fresh ideas… and having Glenn carry that mantle represents our step in the right direction," states Erick Finley. Mr. Shapiro defined his mark in the trade by working the many essential bases of growing an asphalt business from leadership positions. He spent over 12 years in the paving industry and earned his reputation and his holistic understanding of the world of asphalt. From companies on the rise to veteran pioneers like Finley, Glenn Shapiro's stellar track record carries a consistent mark of renewed vision to support quality service while inspiring internal improvements for the company he represents. He led marketing teams, expansion projects and national campaigns for major asphalt companies in the Northeast (such as Greenpatch, Cold Mix Manufacturing, RCA Asphalt, and GemSeal to name a few). Glenn captured many major touchdowns in the municipal and commercial fronts while earning new trusting relationships from the top players. Glenn Shapiro enters the new year 'armed and ready' with a new set of resources that grants him the keys to make even more of a difference and shape the next stage of success for the Finley brand. His dedication to "spearhead the development, communication, and implementation of effective growth strategies" means adapting to today's competitive arena and demands while facing the next phase of Finley's performance design. Finley recently celebrated their 50th anniversary earmarking its growth through new partnerships, acquisitions and expansion. Founded in 1965 by Lonnie Finley as a 5-person paving crew, today’s Finley exploded into a recognized company of over 150 workers and multiple locations to serve the entire Mid-Atlantic Region and flexes their commercial service presence in the spring of 2017 by finalizing the acquisition agreement of former competitor Mid-Atlantic Paving & Sealing. 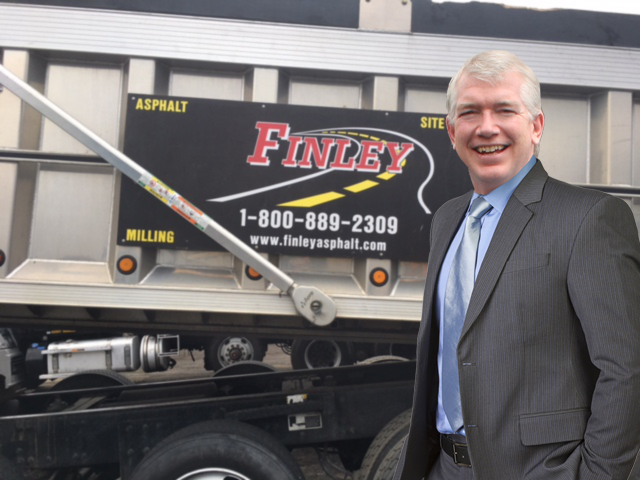 This strategic purchase allows Finley to maintain leadership in the market by expanding their geographic territory. Finley is now able to service areas from Baltimore, MD to Richmond, VA. The merger strengthens the company's resources to maintain consistent work quality and availability. The purchase is the first in Finley's history. Mid-Atlantic was established by Robert B. Osburn, Jr. in 1986 and operated from the Richmond area. Mr. Osburn's daughter Ann Kramer Stinchcomb "grew up in the business" and became a project manager and shall continue this role with the Finley team. Ann says, "This merger brings two great companies together to provide much more for our combined list of clients... our Mid-Atlantic customers will surely benefit." Property managers & owners have a strata of risk exposures to consider. From emergency situations to structural faults that can lead to physical harm or damage, any of those exposures can be catastrophic. PM’s need about as much cognizance on safety as a contractor, but the PM's challenge is that their risk is spread over many different exposures. Historically, liability claims from infrastructure issues increases the cost of risk-- from auto damage inflicted by a pothole or even a personal injury from a crack in the sidewalk or parking lot. Any such claim could result in serious loss in business for the owner. Codes are guidelines for the PM to be aware of these risks such as building access areas like parking lots and walkways. I have seen enough cases proving that the exterior‘s safety considerations are often less prioritized- which is a huge mistake. As the old saying goes, you will never get a second chance to make a first impression. The condition of your parking lot is one of the first things your patrons will encounter when arriving at your property and there’s nothing more inviting than the welcome of a smooth and clean driving surface of a well-maintained pavement. FACT: No one enjoys rattling and thumping as their car drives over pavement cracks and potholes. The extreme fluctuations in with the Mid-Atlantic climate puts major stress on parking lots and roadways. From the blistering summers to the snowy winters, asphalt is more susceptible to premature failure and deterioration if not properly maintained. Like landscaping, mass devastation can occur if you did not re-plant, fertilize, water or prune on schedule. 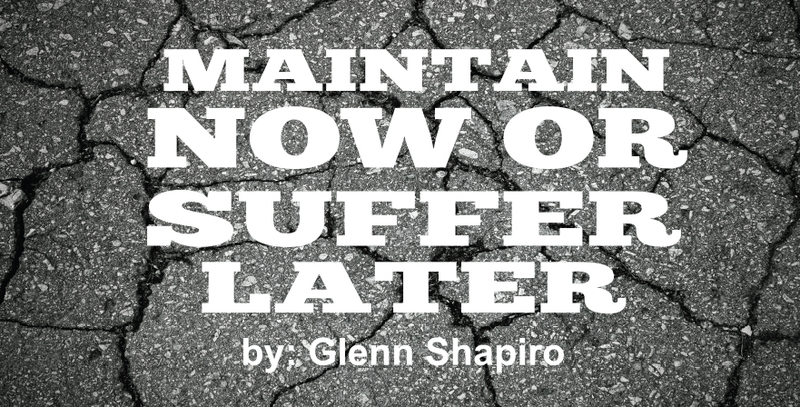 The same goes for Asphalt; maintenance must be part of your yearly plan. Crack fill, seal coat and minor patching will SUBSTANTIALLY increase the life span of your asphalt. The biggest killers of asphalt are SUN and WATER! The Sun dries the asphalt out, the other breaks it apart through freeze and thaw. If left alone, unprotected asphalt will undergo significant cracking, eroding and crumbling as the beginning of worse things to come. Once this deterioration occurs, water can freely destroy your pavement by seeping underneath- leading to COSTLY repairs later. The most cost effective way to maintain your asphalt is using SEAL COAT- the sun screen for asphalt blocking out the harmful rays and provides a BARRIER to the damaging water. Thinking MAINTENANCE prevents major REPAIR! Be mindful of the age and condition of your parking lot or roadway. Pay attention to the type of traffic you have and keep an eye out for any breaks, cracks or wear spots. Paving companies offer a variety of protective coatings, material types and protocols for quality resurfacing. Much more than aesthetics, a well paved parking lot is largely about SAFETY for drivers and pedestrians alike. It’s best to resurface now- than to REPAVE the entire lot later. June 15, 2017- Pavement Maintenance and Reconstruction, the nation’s most recognized trade publication for the paving and pavement maintenance industry, awards Finley Asphalt & Concrete the Top Contractor award for the 2016 fiscal year- making this achievement the 5th consecutive year. 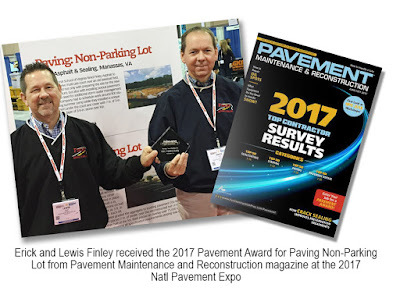 Out of a nationwide poll, Finley receives major honors for the categories of Paving, Sealcoating, Striping and Repair. The Top Contractor award is given to a limited selection of companies recognized in the paving and pavement maintenance construction industry as some of the highest achievers in sales volume. The nomination reflects the strength of their market share and customer recognition. “Finley aims for 100% satisfaction ... referrals are our best source of work and our reputation is everything to us. A Top Contractor means being the busiest and most referred because of quality and performance,” says VP Glenn Shapiro. Asphalt rejuvenators & seal coat formulations have emerged regionally over the last 20+ years as pavement maintenance applications to combat environmental factors causing deterioration of asphalt pavements. Use of rejuvenators is more common in western regions of the US while asphalt seal coat is more often used in regions of the Midwest, Northeast and South. Both technologies evolved by design to arrest the identifiable mechanisms of pavement distress leading to pavement failure. But the major environmental causes of surface weathering in Denver may not be the same as those in Boston. 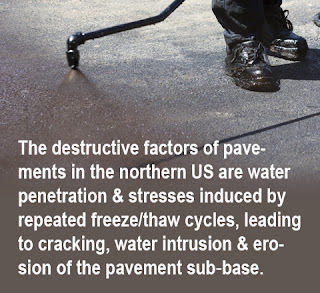 In hot dry climates of the West, the primary cause of pavement deterioration is oxidation and embrittlement of asphalt binder at the pavement surface from prolonged exposure to sun & high temperatures. Loss of fine aggregates from the surface of the asphalt pavement matrix is often attributed as the main cause leading to raveling of larger aggregate and ultimate pavement failure. Rejuvenators are generally asphalt emulsions containing lighter asphalt fractions to re‐soften oxidized asphalt binder at the pavement surface, which assists the binder in retaining encapsulated aggregate fines, and minimizing aggregate loss by traffic wear. In northern regions of the country, asphalt binder oxidation is a minor contributing factor of pavement wear. 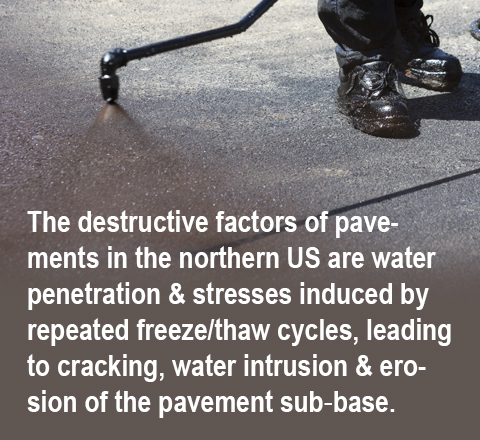 The major destructive factors of pavements in these regions are water penetration and stresses induced by repeated freeze/thaw cycles, leading to pavement cracking, further water intrusion and subsequent erosion of the pavement sub‐base. Seal coat mix formulations are designed to provide a sealing membrane to protect the pavement surface from water penetration, and better address the environmental factors to preserve pavement surfaces encountered in the Midwest and Northeast. Seal coat formulations usually containing sand are widely used in parking lot maintenance programs and are found to be effective in prolonging pavement assets in these areas, where use of rejuvenator formulations is comparatively rare. Both asphalt based rejuvenators and pavement seal coat formulations can be effective, but were each designed to address different climatic factors unique to regional climates, and not suited to one‐size‐fits‐all remedies. BEST PAVEMENT FOR RACING- how asphalt affects any vehicle. To understand and appreciate quality pavement engineering and the effect of good asphalt on the driving experience, let us take on the perspective of a CYCLIST. 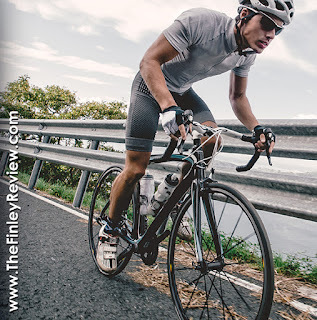 The long-distance cyclist takes on many road conditions are notably the single-best people to discern the quality of any pavement and how they affect your driving experience and the performance of your vehicle on any given road. As with all road vehicles, success in the sport of cycling and the bike's performance completely relies on the "rubber meets the road" dynamics where the surface & texture, aggregate type, condition and flexibility (ability to expand & contract in certain temperatures) all pay a significant role in the cyclists' physical endurance and the tires' overall response. "micro-shocks" that bring a vertical resistance to your frontal motion as your tires are constantly lifting above ground in each mini-bump. This causes significant reduction in the adhesion between rubber and road, reducing your forward thrust and glide. Eventually, asphalt aggregates flatten out more once enough tires roll over them enough times- but what remains is a certain level of adhesiveness of the asphalt material interacting with your tires. It is this adhesiveness that forms the GRIP - especially at higher speeds equating to higher temperatures supporting and adding to your vehicle's frontal propulsion. The asphalt liquid binder is usually a petroleum-based product and is engineered to endure the day-to-day wear of any road or street. Over time, the adhesion of asphalt onto itself wears with age, climate changes and the daily abuse from heavy vehicles (flattening or compressing the asphalt removes the flexibility). It then begins to crumble and form cracks and debris like grains of gravel and sand on the surface that adds to the loss of tire grip and friction. This reduction in grip translates into tire slippage which also adds to speed and performance loss. POTHOLE SEASON IS ALL YEAR ROUND! Finley Asphalt and Sealing has been family-owned for over 50 years. This gives our customers confidence that we will be around long after the project is completed. With this history, the family-based spirit that our company always preserves is the dedication to being connected with our community. Through our many efforts, Finley supports public safety and awareness, education and support for our environment. The Finley Review is one of the many ways that we enforce these three worldly interests by maintaining a public forum and a communication bridge between us and our community through our newsletter, our blogs and the many public functions which we sponsor and attend.